Carpe Diem: Save the world! Random acts of kindness + cake = my favorite things! Excitement overload: RSPB pin badges arrived! 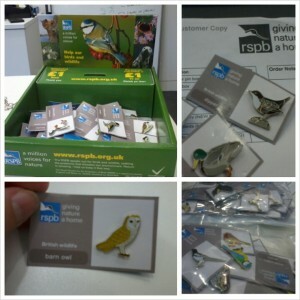 Received my RSPB pin badge box this week! WELL! The kit arrived and I got to assemble my box and put the pins in and definitely snagged a couple cute ones for myself (hello blackbird! hello snowy owl!). Then I took the box round the offices in my building and managed to sell LOADS in the first instance! So excited! It’s amazing how well received they’ve been so far. Some people had requests (for dragonflies and butterflies and puffins and more of the Scottish animal and plant badges), so I’ll need to request more of the other sets of badges. But it’s a great, great start! I can’t wait to report our success to the local rep come the end of the month! 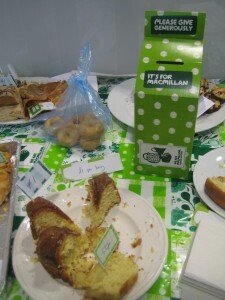 We’ve also just participated in the ‘World’s Biggest Coffee Morning‘ at my work, for Macmillan’s Cancer Trust. My colleague had heard about it, and as I regularly organise a Coffee & Cake mixer once a month at work, we decided to co-opt this month’s C&Cs to raise donations for Macmillan’s! My colleague did most of the hard work: organizing the cake donations. And we all mucked in on the day to raise a couple hundred pounds! Very proud. I got indecisive as usual and made a couple different things: red velvet cupcakes and lemon drizzle bundts (throw-backs from our wedding cake!). Loving getting involved in good causes!